Curcumin Gold Grade 95% Standardised Extract Plus 1% Piperine - 100 g Loose Powder. Home / Vitamins, Minerals & Herbs / Curcumin 'Gold Grade' 95% Standardised Extract Plus 1% Piperine - 100 g Loose Powder. 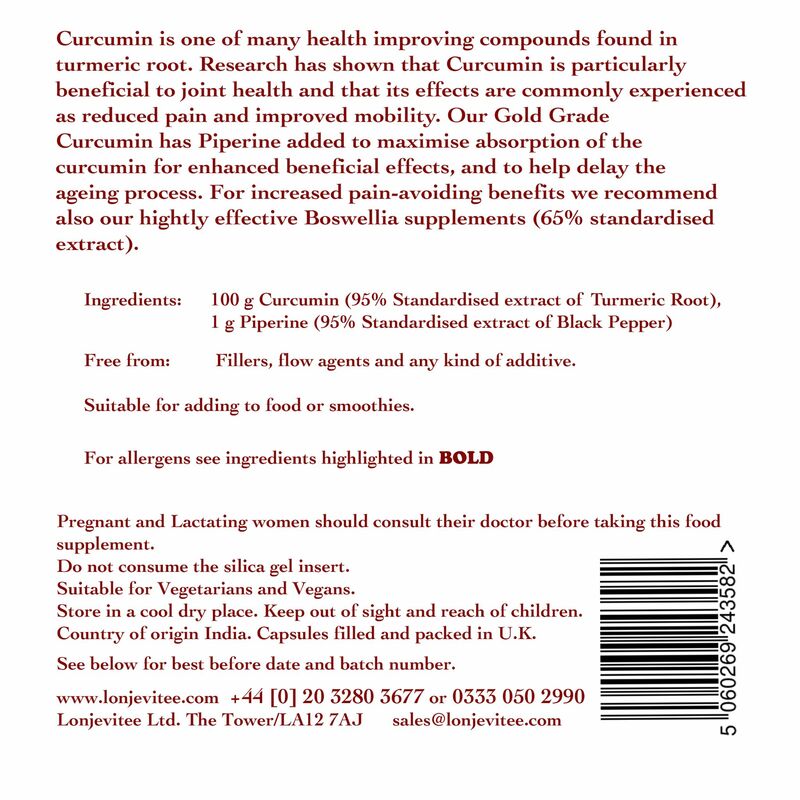 Curcumin 'Gold Grade' 95% Standardised Extract Plus 1% Piperine - 100 g Loose Powder. Advanced 'Gold Grade' 95% Curcumin, 100 g of standardised extract with added Piperine for maximum absorption. 100 g of Curcumin powder with added 1% Piperine. Our Gold Grade Curcumin has 1% Piperine added to maximise absorption of the Curcumin for enhanced beneficial effects, and to help delay the ageing process. For increased pain-avoiding benefits we also recommend our highly effective Boswellia supplement (65% Standardised Extract). Serving suggestion: Can be added to smoothies or food to suit personal requirements. Ingredients: 100 g Curcumin (95% standardised extract of turmeric root). Plus Piperine (95% standardised extract of Black Pepper). Country of origin India. Packed in UK by Lonjevitee Ltd.
Curcumin powder can stain your fingers when handling. It will wash off with soap and water, however, please take care not to stain your clothes.